Racing along at a speed of 2.66GHz, the Intel Core 2 Duo E8200 processor should give any formerly single-core piece of hardware a significant boost of speed and power. 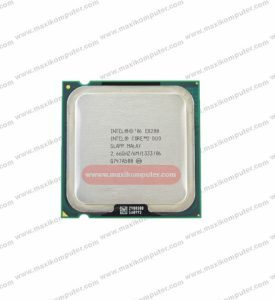 This Intel desktop processor, which is part of the Wolfdale series of CPUs by Intel, features two cores, sizeable 6MB L2 cache system, and a number of other features, which have all the power you’ll need to upgrade your older system to run at higher benchmarks for performance at great value. 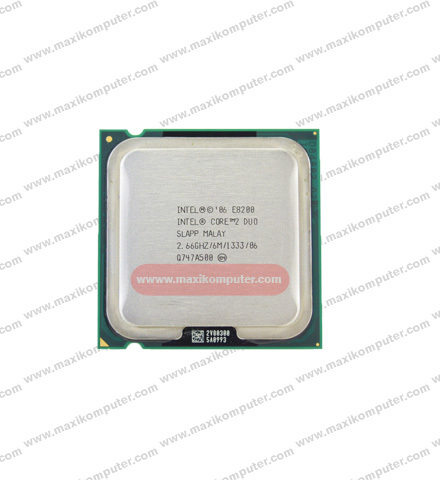 The Intel Core 2 Duo E8200 has two cores ready to power the computing capabilities to your specifications. Two-core technology essentially means that your system will run as if there are two CPUs inside, which allows for parallel computing – highly threaded software applications can get more work done in parallel, completing tasks sooner. The bus speed, which measures data transfer between computer components or between computers, is 1333MHz FSB. FSB, or front-side bus, carries data between the CPU and memory controller hub. The 2.66GHz processor on the Intel Core 2 Duo E8200 is speedy enough to handle most software tasks. However, overclocking is possible with this series of chips for advanced users looking to push their GHz speed a bit higher and into the GHz range produced by the Intel E8500. Overclocking for higher GHz may require an advanced motherboard or other advanced hardware, such as high amounts of RAM, in your computer, and should only be attempted by knowledgeable users. Those looking to use a chip from this series for gaming, combined with a graphics card containing a dedicated GPU, will find it produces solid graphics. The CPU hardware cache is 6 MB L2 cache memory, which shares that amount of information between each core for quick access, cutting down processing times across your system for high performance. The Intel Core 2 Duo E8200 supports type DDR2 RAM. The instruction set is 64-bit. Intel 64 architecture improves performance by allowing systems to address more than 4GB of both virtual and physical memory. The socket, which provides the mechanical and electrical connections between the processor and motherboard, supports LGA775, and the package size is 37.5mm by37.5mm. The max thermal design power (TDP) is 65W. For those looking to use this chip within a custom machine, the voltage is 0.85-1.3625 volts, which will help you accurately select the power supply used with your machine. The Intel Core 2 Duo E8200 also features Enhanced Intel SpeedStep Technology, which switches both voltage and frequency in tandem between high and low levels in response to processor load. You get the speed and power you need when your software requires it, and the rest of the time, your hardware will be using less power, which reduces wear and power bills. This CPU is a tray microprocessor that does not come with a heatsink or other cooling built into the chip. The Intel Core 2 Duo E8200 is a top performer from Intel’s Wolfdale series of CPUs that can run your software with blazing quickness. The 2.66GHz processing speeds mean you’ll be getting solid hardware from a trusted manufacturer.